Like many manufacturers, a major paper manufacturer in Mobile, Alabama wanted to get a handle on their compressed air usage costs so they turned to the flow experts, local USA weber distributor Dwight W. Prouty Company. This particular plant uses three air compressors each of which can produce up to 1,770 horsepower (873 KW) with a combined maximum output of around 33,000 sCFM (934,455 l/m) at 115 psi (8 bar). In this particular case, production depends on the air from these compressors being available around the clock 365 days a year. Since shutting down the air systems was not an option, the flow sensor had to be capable of being installed and serviced without disrupting production. 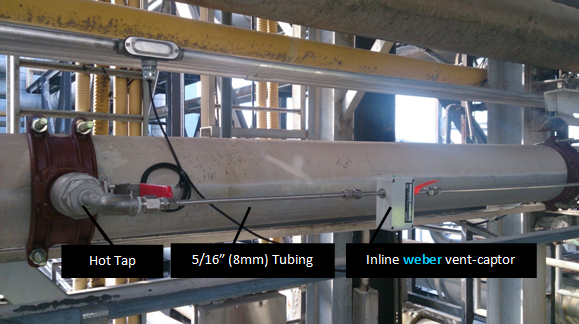 The highly accurate inline vent captor was installed via hot tap in parallel with the main air line at a distance of about 6’ (2 meters) to ensure non-turbulent flow. When the two hot tap valves are opened, a minor amount of air is “scavenged” from the main line into the vent-captor that is directly proportional to the amount of air passing in the main. This also allows the service of the sensor to be performed without any disruption to production. Of course, given the vent-captor’s legendary reliability, the plant people probably wouldn’t have to worry about that for a very long time.